Keep motor capacitors securely in place with this mounting hardware. Use it to mount motor capacitors in any position on a motor or flat surface to keep them out of the way and prevent the connections from shorting. 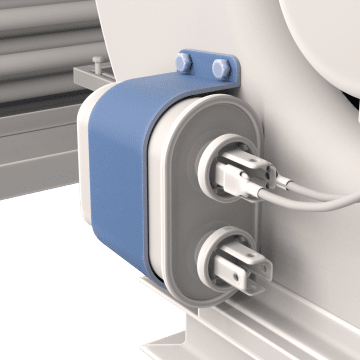 For added protection, cover the motor capacitors' exposed wire terminals with connection protectors to help guard personnel from electric shocks and weatherproof the capacitors' lead connections. Use these mounting clamps to attach run capacitors with oval bases to motors or flat surfaces. Designed for use with round run capacitors, these brackets wrap around the capacitor to secure it to the motor or flat surface. Get everything you need to mount oval run capacitors and protect their connections with these kits. The kits include a metal bracket for mounting a capacitor, a rubber boot for protecting the capacitor's wire terminals, and mounting hardware for securing the bracket in place. Protect the wire connections on oval run capacitors from the weather with these terminal guards. They also help prevent personnel from accidentally touching exposed terminals. Attach start capacitors to motors or flat surfaces with these mounting brackets. They require a start capacitor end cap to hold the bracket in place. Cover the tops of round start capacitors with these end caps to protect lead connections from the weather and help prevent accidental contact with exposed terminals. They require a start capacitor mounting bracket to hold the cap and keep the capacitor securely in place. Prevent accidental contact with exposed wire terminals on oval start capacitors and protect the capacitors' connections from the weather with these start capacitor covers.